Wendy spends most of her free time with her family. She has two sons (13 and 6 years old), and they like to get outside to go hiking, swimming, and bicycling. They can also frequently be found working through puzzles and going on mystery scavenger hunts together. Scientifically speaking, Wendy is a human molecular geneticist. She seeks out rare and unexpected causes behind health problems in people. Her laboratory works to identify genes that cause human diseases and use this information to inform the creation of novel treatments in the future. Her father was an organic chemistry professor and her mother worked in a medical laboratory, so Wendy was surrounded by science and medicine growing up. With a logical, mathematical, and analytical mind, Wendy found that science came naturally to her. She became determined in high school to achieve the ultimate trifecta of becoming valedictorian, winning the Westinghouse (now Intel) Science Talent Search, and becoming a National Merit Scholar. With the promise of a new car from her father and a growing passion for science to motivate her, Wendy achieved all three goals. All these years later, she is still waiting for that car. When she started as a faculty member, Wendy was naïve about the grant process. When she applied for her first major grant from the National Institutes of Health, the responses from reviewers were devastating. She had made a lot of rookie mistakes, and it took her over six months afterwards to really get over her worries of whether she could make it in science. Wendy also experienced a major tragedy when she lost her second son. This made her re-evaluate her life, and Wendy dramatically shifted her research direction so she could work on questions that could really make an impact on the world. One of the things Wendy loves about her job is being able to work with the families and patients who are living with the conditions she is studying. Seeing the science advance over the years, watching the children grow up, and knowing her research has helped them has been really rewarding. It is phenomenal to be able to directly see the impact that their efforts in the lab are having for the patients. There are times when Wendy has to go on house calls for emergency genetic testing. In some cases, her patients are newborn babies with serious genetic conditions. These house calls might involve flying all the way to the Middle East on a Friday and hurrying home by Sunday Evening to be back at work on Monday. It can be tiring, but it usually only happens a few times a year, and it is wonderful to be able to help. Wendy’s lab has a tradition of holding an eating competition each summer with all of the summer students. The tradition has been going on for about ten years, and they switch the food each year. Previous challenges have included hot dogs, garlic knots, pies, Reece’s Peanut Butter Cups, and fries. The winners of the contest receive a pig-shaped trophy (and serious bragging rights). When you’re thinking about what to do for your career, choose something that you love doing and are honored that someone will pay you to do. That way, you can go to work each day to do your hobby. If you’re interested in a career in science, be open-minded. There are so many excellent career options for scientists in addition to the traditional academic research positions. 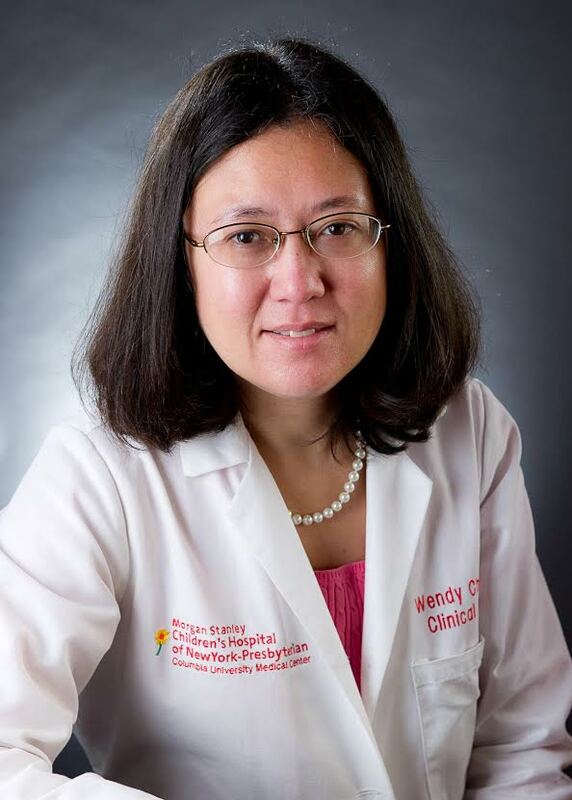 Wendy is a clinical and molecular geneticist who directs NIH funded research programs in human genetics of obesity, breast cancer, pulmonary hypertension, and birth defects including congenital diaphragmatic hernia and congenital heart disease. She leads the Simons VIP study characterizing genetic forms of autism and tests novel treatments for autism in clinical trials. She has authored over 200 peer reviewed papers and numerous chapters in medical texts. Wendy is renowned for her teaching and mentoring. She is a member of the Glenda Garvey Teaching Academy and has won many awards for teaching including the Charles W. Bohmfalk Award for Distinguished Contributions to Teaching, American Medical Women’s Association Mentor Award, and Columbia University Presidential Award for Outstanding Teaching. She was the original plaintiff in the Supreme Court case that overturned the ability to patent genes and is a member of the National Advisory Council for Human Genome Research and the Genomics & Society Working Group. Dr. Chung enjoys the challenges of genetics as a rapidly changing field of medicine and strives to facilitate the integration of genetic medicine into all areas of health care in a medically, scientifically, and ethically sound, accessible, and cost effective manner.